On the morning of August 27th, we had to forgo the sumptious breakfast buffet at Smile House for an early trip to the Ko Samui airport. This airport, however, is quite a pleasant, open-air experience. In fact, I don't think there's anything "indoors" at all. After what seemed like an impossibly short flight, we were in Hong Kong. A world apart, but also instantly impressive. Immediately you notice how tall the apartment buildings are. We used to live on the 25th floor of a 33-story building in Toronto, but that would look short here. The "airport express" system got us quickly to our hotel in Kowloon. It's a YMCA, but it's more like a 4-star hotel, and it's in the ritzy neighbourhood of the Peninsula Hotel. We are so glad we reserved this place! 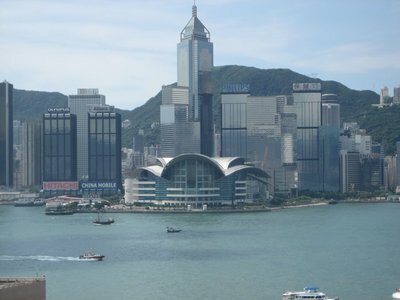 Especially with the harbour view of Hong Kong Island. Just before 8 PM, we raced back to our room, threw open the curtains, and turned on the radio for the "symphony of lights." Anica's been looking forward to this, and it didn't disappoint. The skyline is lit up with lasers, searchlights and patterns of coloured lights for a 13-minute spectacle set to music. And we had the best imaginable view of it right in our room. The first full day in Hong Kong started the way the previous evening had ended: running the gauntlet of touts up Nathan Road. This is the main street of Kowloon, and features the notorious "Chungking Mansion" hostels, where we definitely were only looking from the outside. A few blocks north, however, and we were in tranquil Kowloon Park, with its sculpture walk, aviary, playgrounds, fish ponds, and an unfortunately-closed-on-Tuesdays-for-maintenance indoor/outdoor swimming pool. We then purchased, and made immediate use of an "Octopus Card" (not as exciting as it sounds, but a very convenient and good deal for one tap transit and other purchases). 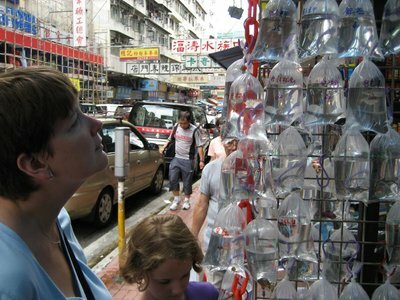 We emerged from the MTR in the area known as "goldfish market," which sure enough was a big hit with Anica. It's a strip of about a hundred aquarium stores. Although fish were not souvenirs we could take with us, it was a colourful delight to just browse. With a couple exceptions: Anica witnessed a fish (presumably sick) being pulled from its tank and left to die in a garbage pail, and Jenn pointed out one store selling huge amounts of coral. A small restaurant ("Happy Family Farm" noodle house) made for a nice stop, then it was back on and off the MTR again for a visit to the Jade Market. It's a covered structure, where selection and quality is huge. We bargained for a couple of pieces, although Anica repeating "this one is what I want" didn't help our cause. Dinner was at a popular HK sit-down restaurant chain called "The Spaghetti House," which is just what it sounds like and very tasty. Most of the diners were locals, not tourists. Then, for the second night in a row, we saw the light show. Anica and I enjoyed a brief swim in the hotel pool before calling it a day. August 29th turned out to be a great day in HK. First, we spent a couple of hours in the China Travel Service office and got great help with our local/domestic flights coming up for China. Then, we took the Peak Tram to (duh) "The Peak." It's a great, green, steep ride that we enjoyed more than the Georgetown funicular. After lunch (bizarre, but nice at "Bubba Gump's," the Forrest Gump themed seafood restaurant at the Peak Tower), we met Jenn's cousin Mike. The car ride back down turned out to be as much fun as the tram, as he toured all over up and down the hillsides until it was time for Abby and Isabel to come home from school. 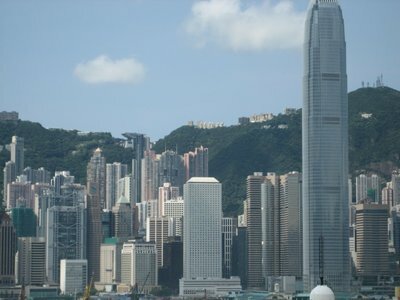 They live on the far side of Hong Kong Island, and it's so different from the city. 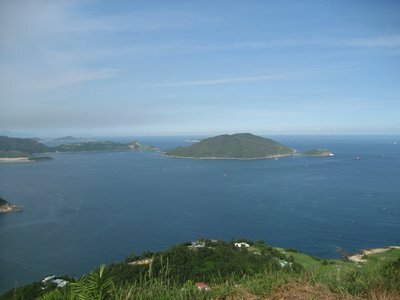 They have a view of a green, forested peak, and a bay below. Mike teaches at an International school, and he gave us the tour of the campus. It's 10 stories tall, befitting the slope of the hill it's built on. The family's apartment is on the grounds, like many of the faculty. Anica enjoyed playing with her cousins (once removed? I never knew how that works), and Mike and Siu Ling had us for dinner. It's really great to be in someone's home for a meal, the first time since Vancouver we've had that pleasure. As for getting home (it was a school night for them...ha! ), Mike drove us to the HK Island side of the Star Ferry run, and we took the floating landmark across to Kowloon, a spectacular end to a wonderful day. Hi, it's the wonderful husband here again. Today we took a very expensive and time-consuming, but not unrewarding, trip to Macau. We should have known better, because the Venetian Macau, now the world's largest casino, just opened two days ago. We were going for the history - really - but we wanted to get a peek at the Venetian until we heard that even a taxi could only get you within 20 minutes' walk of the place. Even though jet foils leave HK harbour every 15 minutes, we still had to buy a "superclass" ticket in order not to wait around for two hours. This turned out to be like an airplane's first class, complete with leather-chaired waiting lounge and an onboard meal that economy class did not get. So we ate five meals today. That kind of made up for the big lines at customs both ways. The turbojet boat itself was so smooth it didn't feel like we were going fast, but we were. Arriving in Macau we took the opposite tactic, and caught a public bus instead of waiting and paying for a taxi. 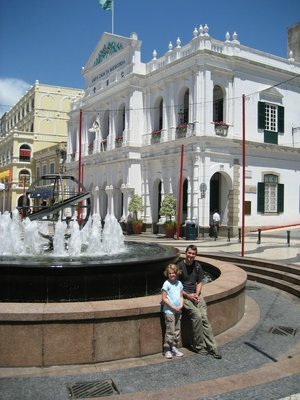 We chose the right route to get to Senado Square, the heart of historical Macau. This was indeed a beautiful, pedestrian only square, with streets radiating out from it. Bustling, yes, but again, only foot traffic. The bright sun made the colours on the colonial buildings dazzling. Free of charge, we explored the Lou Kau Mansion, a prominent merchant's home from the late 19th century, and saw how the Portuguese and Chinese influences had fused. We also all enjoyed the civic library's rare books room. No photos allowed there, but it's a classic old wood-panelled library with books under glass open to pages of Chinese to English or Portuguese translation right back to some 16th century volumes. The ruins of St. Paul's cathedral were also striking. Just the facade is left after an 1835 fire. This still stands dramatically at the top of the steps and street below, blue sky streaming through its stone window frames. We bought some cookies at a bakery that seemed incredibly popular, after enjoying their free samples. Many stores sold a kind of gelatinous pork jerky (Cantonese sweetmeats) that is cut with scissors into the square size you wish. Not too bad tasting, but for that we didn't go beyond the free sample. Dinner came only after a fruitless hour long walk that brought us back to Senado Square. At least the food was good, in the Asian-influenced Portuguese style that you would expect of Macau. After the long day, we were happy to enjoy a quiet day on Friday, devoted to doing laundry, and highlighted by seeing (in English) The Simpsons Movie. The AMC theatre was great; all the movies in HK are reserved-seating, and they had salty popcorn here, whereas most we've seen has been sweet. Saturday was another great day with the Bakers, albeit tiring. 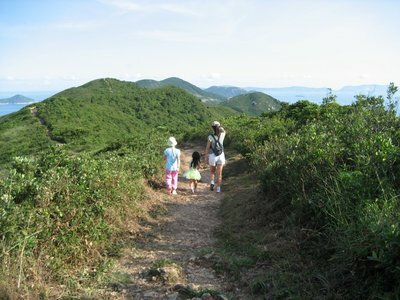 We went on a 2 1/2 hour hike, seeing a side of Hong Kong Island that many never do. The peak we climbed is called the Dragon's Back, and it wasn't too hard, except none of us had enough water. The grownups couldn't believe how Anica and her 2 younger cousins handled the hike with a minimum of whining. 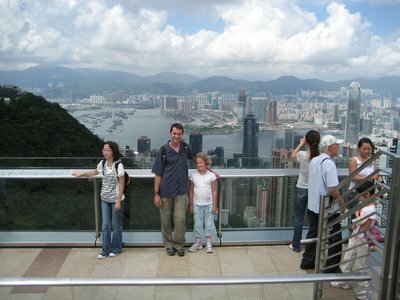 It was such a sunny day that we had the best possible views, including one of the valley where their home and Mike's school is, of Stanley, and ultimately of the village called Shek-O. We walked back down to Shek-O road, and caught the bus into town - a beach village, really, and ate at this great, casual Thai place where our sweatiness wasn't a factor. The girls loved the ice cream, with the lemon sorbert served in a hollowed-out lemon, and the coconut in a...well, you get the idea. It really was great to do something local and unique. The hike was well worth the effort. Today - Sunday, September 2nd (isn't there something I'm supposed to be doing? )- we capped it off with Dim Sum lunch, again with Jenn's cousin's family. Siu Ling's local knowledge helped us enjoy a treat - a restaurant on the 56th floor. The kids loved the trip up in a glass elevator. She ordered all the dishes from the no-English menu and they were great. Afterwards we strolled through impeccably-manicured Hong Kong park, dodging raindrops long enough to enjoy the large aviary. We said our goodbyes and, other than one last viewing of the "Symphony of Lights," our Hong Kong experience was ended. 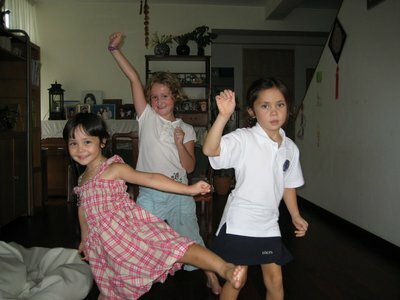 Connecting again with Mike and Siu Ling, and having Anica get to know Abby and Izzy, has really made this week special.